The following is is a list of the players who have scored the most points in one quarter in NBA history. I've listed all the NBA players who have scored at least 30 points in one quarter, a total the vast majority of NBA players never even score in one game. 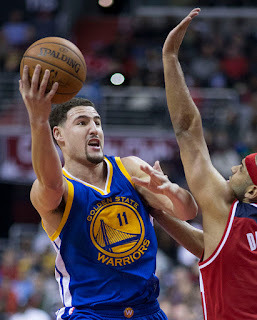 On January 23, 2015, Klay Thompson of the Golden State Warriors scored 37 points in the 3rd quarter of a 126-101 win​ over the Sacramento Kings to set the record for most points scored in one quarter of a NBA game by a player. Thompson made all 13 shots he took in the quarter including going 9 for 9 from three-point land and he also made 2 out of 2 free throws. For the game, Klay Thompson scored 52 points while making 11 threes which is one short of the NBA record for most threes in a game. Just an incredible performance. On April 9, 1978, George Gervin of the San Antonio Spurs scored 33 points in the second quarter vs the New Orleans Jazz to set the NBA record for most points scored in one quarter by a player. In the game, George Gervin had already poured in 20 points in the first quarter, as that was the last day of the 1978 season and he was in a tight battle with David Thompson for the NBA scoring title. Gervin scored 63 points in the game and won the first of his four NBA scoring titles. Melo made 12 of the 15 shots he took in the quarter including four of five threes and he also made five of six free throws to account ofr the 33 points. Anthony also scored 26 straight points during the quarter for the Nuggets, who won the game 116-105 after trailing by 12 points at the half. Melo would finish the game with 45 points. On April 9, 1978, on the last day of the season David Thompson poured in 32 points in the 1st quarter for the Denver Nuggets vs the Detroit Pistons. That is the third​ highest point total for a player in one quarter in NBA history. Thompson was locked in a battle with George Gervin for the NBA scoring title in 1978. He went on to score 21 more points in the second quarter giving him 53 points for the half. He would end the game with 73 points, which is tied for the fourth highest point total in one game in NBA history. Despite all the points, David Thompson finished second in scoring that season to George Gervin who is listed above. When Wilt Chamberlain scored 100 points in one of the most famous games in NBA history on March 2, 1962 for the Philadelphia Warriors in Hershey, Pennsylvania, he scored 31 points in the fourth quarter to get him to 100 for the game. Wilt also​ scored 28 points in the third quarter to get him within hailing distance of the 100 points. Kobe Bryant of the Los Angeles Lakers has scored 30 points in one quarter twice and is the only NBA player to ever accomplish that feat. On December 20, 2005, Kobe scored 30 points in the third quarter against the Dallas Mavericks and finished the game with 62 total points. The next season, on November 30, 2006, Kobe scored 30 again in the third quarter vs the Utah Jazz and finished that game with 52 total points. When Kobe had his 81 point game he scored 27 points in the third quarter and 28 more points in the fourth quarter. On November 26, 1988, Michael Jordan scored 30 points in the fourth quarter against the Denver Nuggets. MJ poured in 52 points for the game. On January 26, 1991, Vernon Maxwell of the Houston Rockets scored 30 points in the fourth quarter against the Cleveland Cavaliers. Maxwell finished the game with 51 points.